Want to join a club that has experienced sustained success? Be a part of one of Melbourne’s youngest senior football clubs. St Mary’s Salesian is now recruiting under 19’s for season 2019. We are excited to announce that Caleb Hounihan has been appointed as our Under 19’s coach in 2019. Caleb is the perfect fit for St Mary’s Salesian due to his eagerness to form and develop an Under 19’s team as well as his breath of coaching experiences. 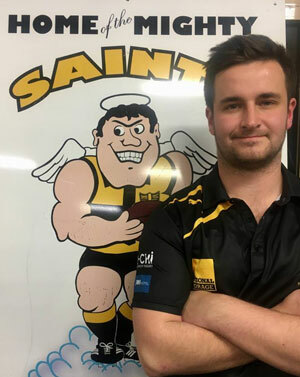 Caleb comes from a broad coaching pedigree, being the head coach at Richmond Junior Football Club Under 15’s in 2017 and the Under 12’s in 2018. He concurrently held those positions while being the Head Coach of the Senior Women’s at Melbourne High School Old Boys Hockey Club since 2015, winning the minor premiership in 2018. Caleb played his junior football at Richmond Juniors, before being Under 19’s Captain and Best and Fairest recipient at Templestowe Football Club. In recent years he has played senior football at South Yarra Football Netball Club.As well, he is currently undertaking a Bachelor of Sports Coaching at Victoria University. St Mary’s Salesian is a strong, family oriented community football club based in Glen Iris. The club plays in the Victorian Amateur Football Association (VAFA) where all players play for the love of the game. We field three open-age men’s teams, with our seniors playing at D1 level in 2019. We are one of the few clubs in the VAFA that fields three women’s teams. St Mary’s Salesian will be fielding an Under 19 team in 2019, so if you’re looking for a great way to keep your mates together, make a few more, and enjoy some team success, St Mary’s is for you! You will be joining a strong and unified club, that provides the social environment for you to make new and lifelong friends. At St Mary’s Salesian there is equally strong importance placed on the club’s on field success and the club’s social culture. Training is conducted twice a week on Tuesdays and Thursdays at Ferndale Park for all teams. As is our tradition, all players, including our women’s team, will share dinner together in the club-rooms after training on Thursdays. For this reason there is a strong bond between all players, across each team and age bracket. During the season the playing group hosts seven large social events, including the Annual Ball, which is the social event of the year. Ours is a young playing list, and our players come from a diverse range of junior backgrounds including Ashburton Redbacks, Camberwell High, Wesley College, De La Salle, Xavier College, Hailebury College, St Kevin’s, Trinity College, Camberwell Grammar, Marcellin College, Scotch College, Salesian College and Mt Waverley Secondary College. We are well used to supporting our players in their studies, and we will be very flexible to your needs. We are seeking Registrations of Interest to join our 2019 St Mary’s Salesian Under 19 team from interested players, coaches, trainers, team managers, volunteers and supporters.